Even though work on the DFG (German Research Foundation) funded project “Making Technology Appropriate” had been picked up by the project’s team at TU Berlin’s China Center for Cultural Studies on Science and Technology in China (China Center) on September 1st, a larger circle of cooperation partners met for the first time on September 16th. Taking part in the kick-off-meeting were the project’s head, Prof. Dr. Wolfgang König, the international cooperation partners from Beijing and Zurich, Prof. Dr. Zhang Baichun and Prof Dr. Mareile Flitsch, the two researchers, Dr. Dirk Forschner and Philipp Mahltig, the head of the China Center, Dr. Eva Sternfeld, as well as the Center’s student assistant, Jonas Fahlbusch. 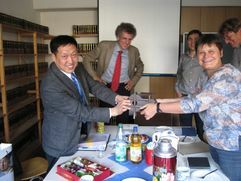 At the end of the meeting Prof. Dr. Zhang presented a generous gift to the China Center – a model of an air classifier. Air classifiers were being used in Chinese agriculture from the 1st century AD onwards. The technology was unknown in Europe until the 18th century when it was transferred to Europe from China.